The 2017-18 WHL regular season is now just one month away, but for players, staff, volunteers, and families, the hockey season begins this week. 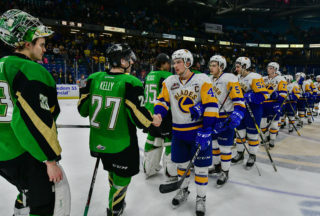 Players will be arriving back in the bridge city this week and registering in for training camp on Saturday morning at SaskTel Centre. Here at the Blades offices everyone is busy preparing for the season and putting the finishing touches on everything before the players arrive for main camp. The camp schedule was released Monday, rosters will be published on Friday, and on the Thursday the Blades will be holding a special media conference. 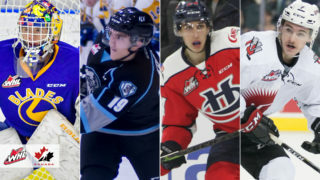 While the puck won’t drop on the 53rd season of Blades hockey for another month, there are plenty of question marks heading into camp weekend making for exciting times in Saskatoon. Which 20 year olds will the Blades keep? Which prospects will crack the lineup? And how will the most recent draft class compare to the rest of the players at their first WHL camp? Let’s start by getting you up to speed with the Saskatoon Blades before camp starts. Libor Hájek will be returning for his 3rd season with the Saskatoon Blades and is expected to be a top pairing defender for the second consecutive season. Hájek signed an entry-level contract back in March with the Tampa Bay Lightning who selected him in the 2nd round of the 2016 NHL Entry Draft. He then spent the rest of the year with the Lightning’s AHL affiliate, the Syracuse Crunch where he scored his 1st professional goal. Hájek was the odd man out at the World Junior Championships last year getting released by Team Czech Republic just before the tournament began, but one has to think he’s a shoo-in this time around. Cameron Hebig had a breakout year in the 2015-16 season with 69 points in 59 games earning an invite to Pittsburgh Penguins development camp. Hebig impressed yet again at development camp which got him an invite back to main camp. Unfortunately he was unable to attend due to injury which saw him miss the entire 16-17 season. Hebig is back to 100% health and ready to get back into action and on the NHL radar once again. Click here to watch the full feature from Pat McKay of CTV Saskatoon. The full training camp schedule & details were released on Monday and the full camp rosters will be available to the public on Friday. The camp will consist of 73 players; 37 forwards, 28 defensemen, and 8 goaltenders. 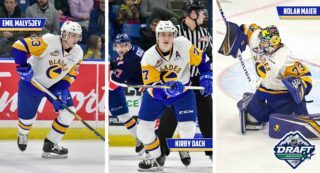 Nine of the Saskatoon Blades 2017 draft picks attended their respective province’s U16 development camps this summer and seven of them have made the shortlist rosters. From British Columbia goaltender Koen MacInnes, defensemen Aidan De La Gorgendiere and Kurtis Smythe, along with forward Kalen Szeto made the list. Forward Kyle Crnkovic made it for Alberta, and d-men Alex Ozar and Kyle Lamoureux for Saskatchewan and Manitoba. Fans will get their first look at the new crop of draftees this weekend at training camp. If your passing through Humboldt, SK, anytime soon, you may notice a familiar face at the Glen Hall Sports Sports Shrine. Long time Saskatoon Blades assistant coach, Jerome Engele, was inducted into the Humboldt Sports Hall of Fame this summer. Engele, who is originally from Carmel, SK, played four seasons for the Blades from 1966-71 before going onto play professionally for eight seasons including 100 NHL games. Despite having an impressive camp, Chase Wouters was a late cut for Team Canada’s U18 National Squad that ended up taking home Gold at the annual Ivan Hlinka Memorial Tournament a few weeks ago. The 2015 1st round pick of the Blades put up 21 points in 51 contests in his rookie campaign and will look to take on a bigger role with the bridge city bunch this year. Passionate about hockey? Team player? Enjoy excitement? The Blades are now accepting applicants for our ice crew! Click here for full details on how to apply. 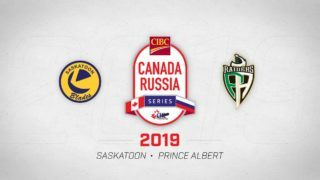 Tickets for the Blades pre-season game in Warman against the Prince Albert Raiders are now on sale! Tickets can be purchased at the Legends Centre in Warman or at the Blades office. General admission is $10 with proceeds going towards Warman Minor Hockey. There will also be a team autograph session after the game. It’s official. The University of Saskatchewan Huskies have announced Jesse Shynkaruk’s commitment for this season. Shynkaruk was a fan favourite in his hometown of Saskatoon last season scoring 31 goals including 10 game winners. This past Saturday the Saskatoon Blades hosted our annual “Night at the Races” for our club seat season ticket members. It was awesome to see the continued support from our loyal fans and great to see everyone again before the season. The Blades would like to thank everyone who was able to attend, and we look forward to seeing you back at the rink again soon! 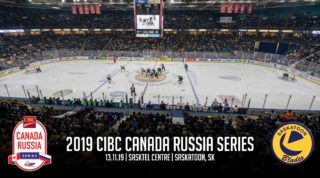 The Blades have scheduled a press conference for this Thursday at 10:00am at SaskTel Centre where General Manager Colin Priestner will be making a couple announcements prior to camp. So plan you coffee break accordingly and tune in on Facebook live! Looks like a good time was had by all the the Kelly Chase Fantasy Camp last weekend. Was nice see all the Blades alumni back in Saskatoon supporting great cause! Since it’s now hockey season at the Blades office, we’re back to hockey season hours!